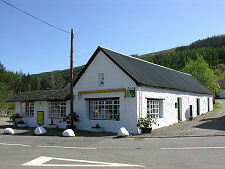 The village of Balquhidder lies near the head of Loch Voil, 1¾ miles west of the line of the A84 as it sweeps north from Callander to Lochearnhead. It shares its name with the glen in which it stands, Balquhidder Glen, which extends westwards for 12 miles from the A84. 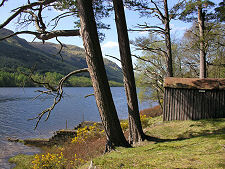 The glen is a true cul-de-sac, with its western end concluding in the complex mountainous country north of Loch Katrine and south of Ben More. 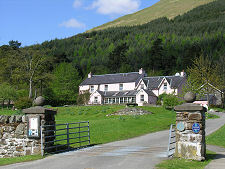 The first problem for visitors is simply finding Balquhidder. 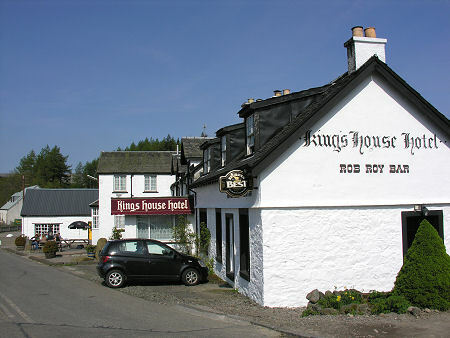 To reach it you need to turn off the A84 not to the west as you would expect, but to the east, at what was traditionally the King's House Hotel, which has been transformed in recent years into the Mhor 84 Motel. 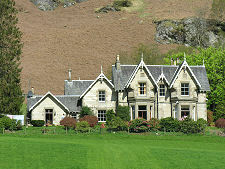 The hotel was built in 1779, for the sum of £40. 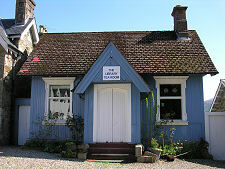 Today it offers a range of accommodation, as well as food and drink for the weary traveller. There is also a nearby gift shop. From here the road leads past a superb old signpost that predates the upgrading of the A84, through an underpass beneath the "new" road, and out towards Balquhidder itself. The heyday of the east end of the glen can be dated quite precisely: from 1870 to 1965. 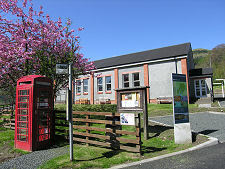 During this time the Callander & Oban railway passed on a line parallel with the modern A84, and there was a station at Balquhidder Station, a mile north of the Kingshouse Hotel. Today it is hard to imagine this as the site of an engine shed, two signal boxes, and a junction on the minor line to St Fillans and Crieff: but it was. From the A84 underpass, the road leads you down to the village of Balquhidder. 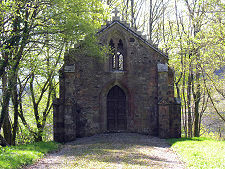 En route you pass the MacGregor Murray Mausoleum, set back from the road on your left, though it is for the grave of another MacGregor that the village is best known. 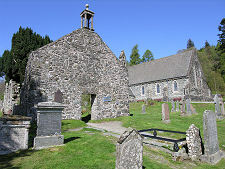 Balquhidder Kirkyard, in which you find both Balquhidder Church and the ruins of the Old Church, is the last resting place of Rob Roy MacGregor who died in 1734. Alongside him lie his wife and two of their sons. 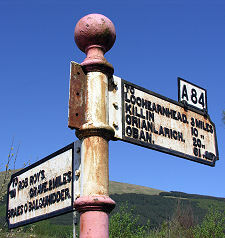 The Rob Roy connection is celebrated by the 79 mile Rob Roy Way which passes nearby on its route from Drymen to Pitlochry. Balquhidder also lies on route of the Coast to Coast Walk from Oban to St Andrews which comes over the hills to the north from Glen Dochart. 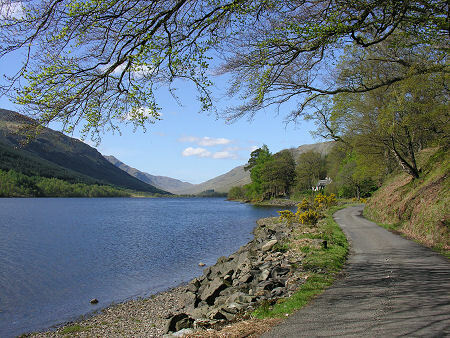 West of the village of Balquhidder, the twisting single track road through Balquhidder Glen makes its way along the north shore of Loch Voil and Loch Doine beyond it. Where the two lochs almost meet you pass Monachyle Mhor Hotel, now one of the major attractions in the glen, with its hotel and self catering accommodation, and renowned restaurant. Beyond Monachyle Mhor the glen takes on a wilder look before the public road eventually comes to a halt at a small car park. From here paths lead out to the surrounding mountains; and especially to Stob Binnein and beyond it Ben More to the north. From the end of the public road a track leads the half mile to Inverlochlarig, which your OS map will tell you is on the site of Rob Roy's House. And as you stand in this lonely spot 12 miles from the A84 junction you begin to appreciate the reason for the name Balquhidder. It comes from the Gaelic "Baile-chuil-tir" which means the distant farm.